This worksheet provides pre and post reading material. 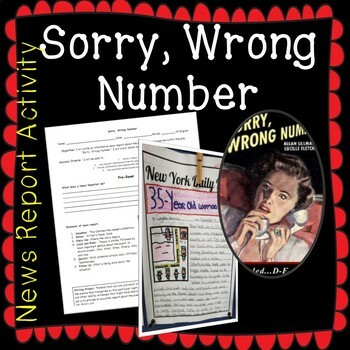 Students are to read the play, "Sorry, Wrong Number" and learn about the murder that transpired. I asked them comprehension questions throughout and had them pair-share. The post reading material is the part that I have added to extend the plot further. This will help them do the News Report. For this activity they are to pretend they are a news reporter arriving at the scene of the murder. Their job is to interview the police officers at the scene and Sergeant Duffy. Once students have gathered information, they will write an informative news report on the crime that transpired. Allows students to collaborate and discuss the evidence. They had a lot of fun with it. Objective and success criteria is included.